Finally got around to sorting out an antenna for the 6 meter band. The antenna arrived yesterday and after receiving the assembly manual from Ken at JK antennas I hope to assemble it and install it onto the tower soon. 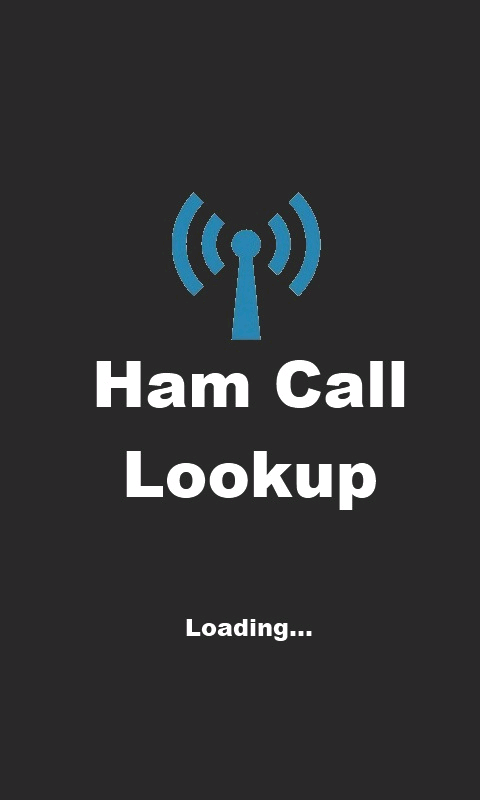 Quick update on Ham Call Lookup - I'm in the process of building an Android and iOS version of the application. I will post further progress notes as development continues. With many thanks to Steve (VK3NF) the support pole for my 'main' Nally tower was erected last weekend (17th of December). This marks a major milestone in getting the tower erected, after some 5 months of dealing with the local council. The concrete is now curing and the next step will be to attach the tower sections to the support pole. Not a great deal to report at present. I recently completed a 're-winding' of the 1:1 co-axial balun in use with the HyGain yagi. The previous incarnation was a simple 'air loop' and didn't look too pretty, although it worked, it was a quick fix at the time and left alone as it seemingly did the job. Over the weekend I re-wound the balun over a PVC pipe former. The co-axial cable is held in place with a series of cable ties and has resulted in around 12 turns of RG-213 cable in a nice neat fashion circular and uniform pattern. As the cable was already terminated and water proofed, I had to be careful and ensure that nothing was disturbed. Balun will be placed below the yagi and affixed to the stub mast when it goes back up in the air. After 16 or so years of almost continuous duty the Diamond W-721 trap dipole has been overhauled. The traps had deteriorated to a point that any moisture would cause serious de-tuning and require an ATU to be switched in-line to use. The Diamond balun was still OK as were the plastic insulators. In fact, apart from the traps the antenna was still quite OK - a very good effort considering the amount of time the antenna has been slung outside and subjected to all sorts of weather in Japan, Australia and the UK. 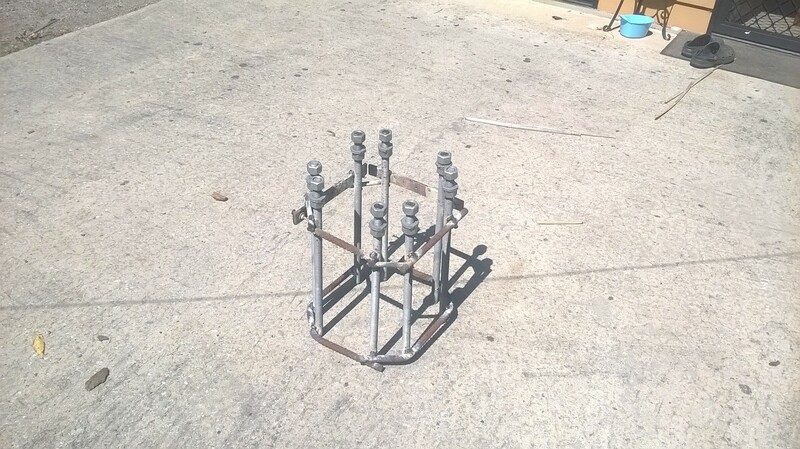 Therefore I went with a 'kit' from Rippletech consisting of two 40 meter traps and new wire radiating elements to allow operation on 40 and 80 meters. Thus far works a treat, tunes up nicely in the SSB portion of 80 meters and covers almost the entire 40 meters band. 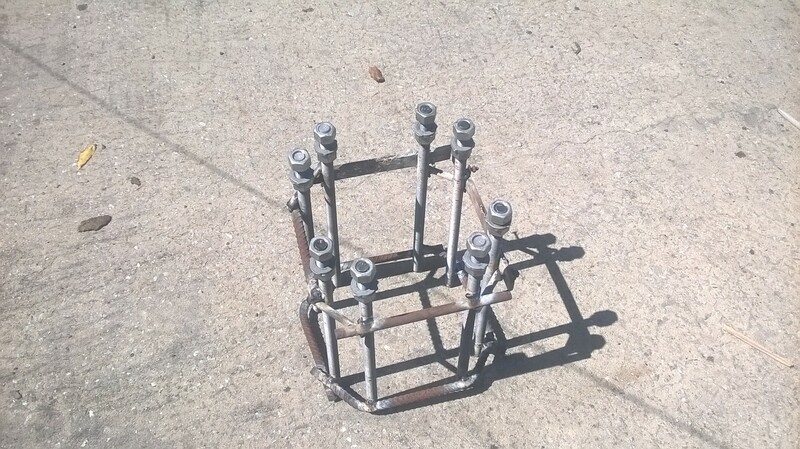 With many thanks to the father-in-law the bolt cage for the tower has been completed. The cage is for a 2 stage tilt-over tower. Next step is to complete the tower refurbishment with a set of brand new 5:1 brake winches and wire rope. Once this is complete there is a bit of welding and repainting with some cold gal paint. Over the last two weekends I have managed to get my HyGain TH3-JRS yagi back up in the air. It has been packed away since prior to moving from the UK to Australia. Very little maintenance required, just one PL-259 soldering job and some minor work on the antenna itself. Pretty much tuned up exactly as it was in the UK when reassembled, lucky that I marked everything clearly prior to taking it all apart. 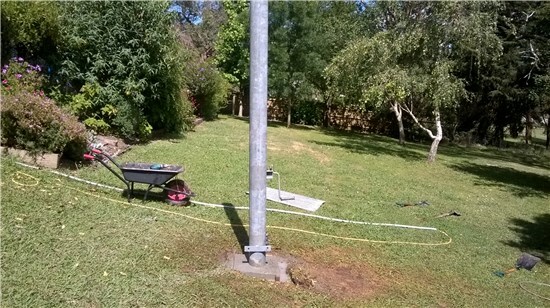 Installation wise, it has been mounted onto a 5.5 metre aluminium scaffold pole. All said and done, including stub mast and rotator the yagi is about 6 metres in the air. Not ideal of course, but 6 metres and operational is better than 0 metres and packed away in the box. I will put some pictures up shortly.